Bread is perfect for mopping up sauces and broth! That’s the basic idea of this wonderful, traditional Italian, fresh tomato and bread salad known as “Panzanella”. A salad that is frugally made with crusty, hefty, day-old bread chunks tossed into tomatoes, onions, and fresh basil with a vinaigrette dressing. This simple and delicious salad is a creation from the Tuscan region of Northern Italy. It’s a great example of how Italians rarely waste any food . . . even old stale bread! In fact, the harder, the more stale and old that the bread is, the better . . . just don’t use any moldy bread . . . that would be really nasty! Now that your tomatoes are at the peak of their season and beautifully, juicy ripe, it’s the absolute PERFECT time of the year to enjoy Panzanella. So grab a strong serrated knife and saw some thick slices of your old bread (best to use a good Italian or French artisanal bread, not the pre-sliced bread that is mostly found in the States). You need a good knife when bread gets this hard. Use the ripest tomatoes that you can. The juice from the tomatoes and vinaigrette juice up nicely together and is soaked up in the bread which then becomes softer, but not mush, since the bread that you need to use is supposed to be hard from the get-go. Too hot to cook indoors? Here’s a great bonus about Panzanella: You don’t even have to use the oven or stove; it’s a lovely, cold salad full of rich summer flavors! Here’s a bit of Italian trivia: Along with the traditional Caprese Salad of tomatoes, basil and Bufala di mozzarella, Panzanella also shows the spirit of Italy in the patriotic colors of its red, white and green colors of the Italian flag! Add some chopped up cucumbers. Add cubes of fresh bufalo mozzarella. OR, add a combination or all of the above! 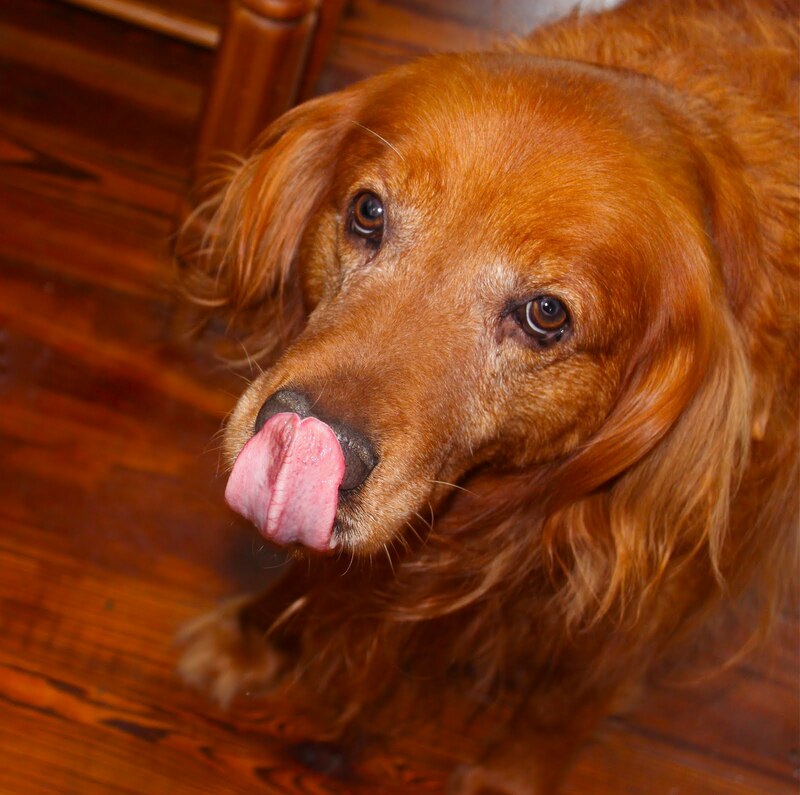 Our golden retriever, “Buckeye”, just loves tomatoes and bread. With the basil and vinaigrette, he was smacking his lips in appreciation! 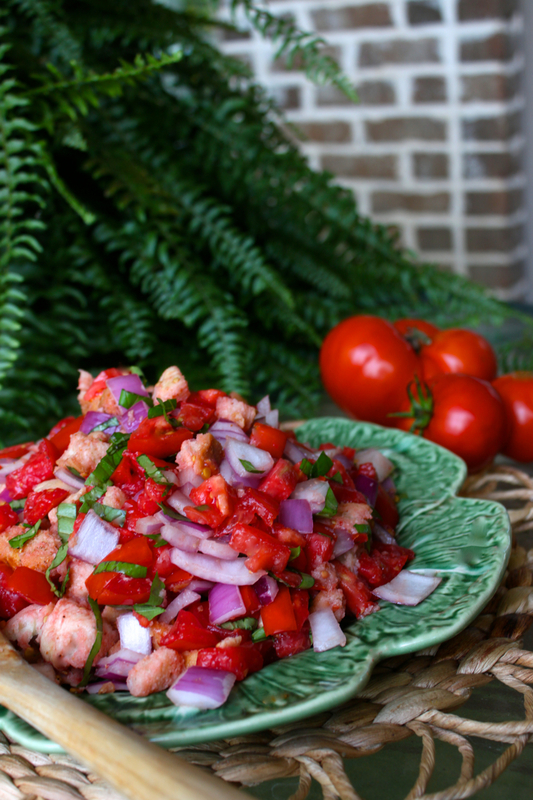 Enjoy this Panzanella Tuscan Tomato and Bread Salad ! I am so happy you made this! I’ve seen the recipe and wanted to make it, but was hesitant. You know, not to sure if we’d like it or not, lol. I’ll take your word for it (plus the beautiful pictures) and will be making this soon 🙂 Thanks! I hope that you do try it Lisa, it is totally, totally yummy! We’re the same here; usually the salad is half gone even before serving to others! I love the juice-soaked bread, but I sure make certain that the bread is extremely dried out — this bread was one week old and PERFECT to hold its shape. 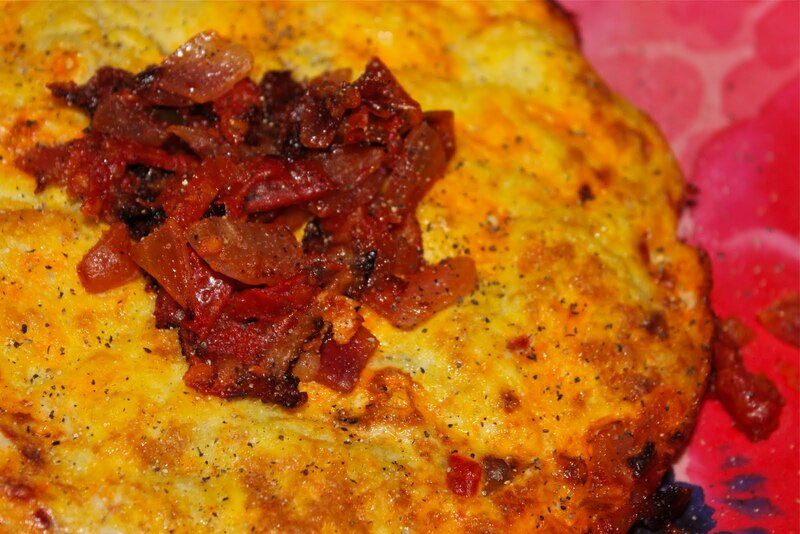 PS Love your beautiful Heirloom Tomato Fritatta too. Mmmmm…this is the most beautiful and mouthwatering Panzanella Salad I have ever seen! I love all your delicious recipes! I’ve eaten this before but I’ve never made it myself. I’ve got half a loaf of sourdough bread sitting on the counter just waiting for me to make this! Thanks. Your photos make it look so inviting. 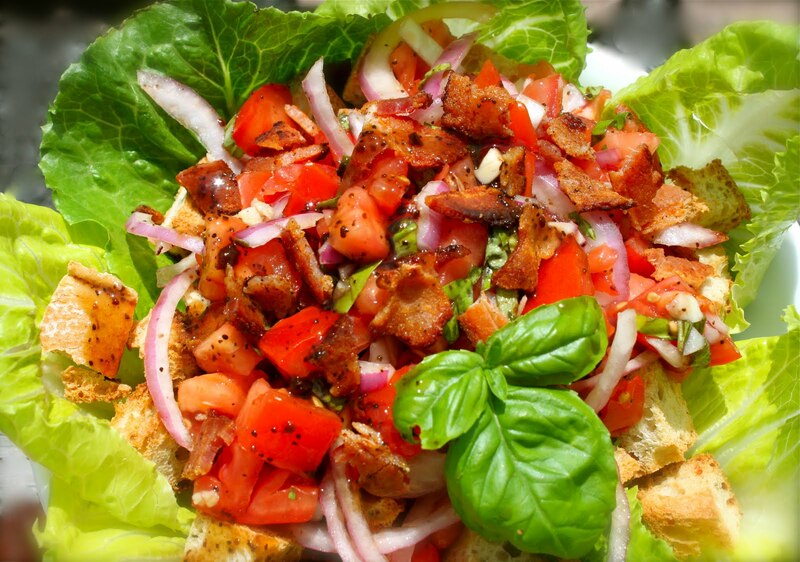 Your Panzanella is gorgeous and looks simply divine! Thanks for another great recipe! Oh this is great option for a nice, light lunch! Thanks for reminding this salad! Leave it to the Italians to turn stale bread fit only for the birds into something glorious!!!!!! Thanks for reminding me of this wonderful summertime dish. I can’t wait to make some now. Your recipe and photos, as usual, look absolutely fantastic. Grazie! Buckyeye is precious Roz and he has excellent taste too. Panzanella salad is one of the best salads ever and as you said, is open to so many possible additions to make it your own. There is nothing like a good panzanella, if you ask me! All that bread sopping up those juices…yum! From Facebook comment by my cousin, Kathy: Roz, I had this salad the first time I was in Tuscany and it was to die for!! Of course it was in a little family owned place our hotel owner sent us to and we would never have stopped in otherwise. The house red wine was served from a pitcher in the kitchen and we drank out of what looked like jelly jar glasses. It was a fabulous meal!! Outstanding Roz – we’ll have to try it soon. i’ve never had panzanella, but i’ve been meaning to try it. yours looks so appetizing! what a perfect salad for these dog days of summer. Buckeye confirms this. Hi Roz, what an amazing looking salad. Thank you for sharing the recipe. LOVE the picture of Buckeye showing his appreciation. Have a great day. Buckeye looks like he loved it. 🙂 I’m sure we will too. This looks delicious. Panzanella is such an amazing salad – when made with the ripest and freshest tomatoes – which is why I don’t make it very often! When I can get thos eperfect ingredients – wow – what a treat! What a beautiful doggie! He’s Italian just like his parents 🙂 Love that you got his picture mid lip smack. hee hee! I love Panzanella!!!! Great appetizing picture! Ciao Bella! You are so welcome Deb! Hope you are doing well in the great Aloha state of Hawaii! 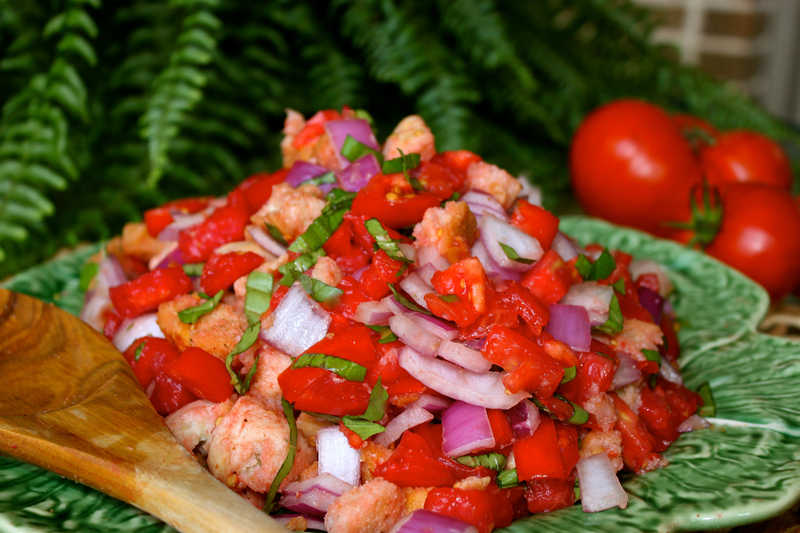 Thanks Carol, panzanella is a really fantastic traditional Tuscan recipe. Bread salad is used to be my go-to lunch….and I usually ended up eating all the bread…sighs.. Your Panzanella looks so fresh and inviting! that’s exactly what I go for first Angie . . . the bread! I ‘sigh’ along with you! I totally get this salad in the late summer. Look at those tomatoes and fresh basil! I would eat this up in nano second (in memory of Robin Williams) Love, love it. Velva, I pretty much ate it all up in a nano second too! How are your tomato plants doing? Ours are still producing, but I can tell that we’re at the very end of the season. That is one gorgeous, welcoming photo! Bring it on! Only in the summer do tomatoes get that rich redness that tells you it’s “for reals.” Will be doing this (sans bread – no or few carbs these days). Love. Love. Love. Isn’t that the truth Claudia? There’s just nothing like summer’s ruby red tomatoes! I’ve never thought about making Panzanella sans bread; I’m sure it is still delicious! So nice to have you stop by! Thanks for posting this! I’ve always wanted to make it and now that my tomatoes are starting to turn, it’s the perfect salad. What a beautiful salad! Sorry to reply so late after this post and your visit/comment! Thank goodness that my husband and I both froze and canned a good bit of our summer tomatoes; I’m already so sad that summer and it’s delicious bounty is over! All the versions of your panzanella look great. obviously your dog agrees with me. Love the photo of him licking his lips! It’s definitely panzanella season! I’m going to have to do a container garden next year so I have plenty of tomatoes at my disposal! me and my mom tell my dad and my husband all the time that if it weren’t for them always needing “meat” then we could just eat a salad like this every night for dinner. I love it Roz. So flavorful and beautiful. You are so right…this is the perfect time of the year for panzanella salad. My tomato plants are bending over with loads of tomatoes right now. Love this, Roz! It looks delicious and I want to try it1 Buckeye is one happy girl! We love this salad Roz, and we make one very similar, but yours looks so much better and probably even tastes much better because they come from your own beautiful garden! Wow – it all looks wonderful – fresh and tantalizing. I want some now – before tomato season is completely over! This looks so delicious, Roz! Such beautiful colors, and I love that the colors represent the Italian flag. I bet it tastes wonderful with your fresh tomatoes from the garden. It’s great to be able to get such authentic Italian recipes from you. Thank you so much! This delicious looking salad is perfect for the summertime when tomatoes area abundant. All it needs is a bit of feta cheese and we can call it a greek salad! Pinning! Yes, you’re right and so creative, Mary . . . adding goat cheese would make this panzanella really sing! Thanks for the idea! I agree with Buckeye; this looks yummy! Thanks for your kind visit and comment Auntipatch! Panzanella is such a wonderful summer treat! I agree, panzanella is a great ‘super fresh/non-cooked’ way to use up fresh tomatoes. I would never make it with the rubbery, tasteless tomatoes offered in stores. Hi Roz!! I love brushetta and this looks wonderful!! hugs!! !